A versatile wide-angle prime for Sony E-mount mirrorless cameras, the Samyang AF 24mm f/2.8 FE is an especially compact, lightweight lens well-suited for travel, landscape, and street photography. The optical design incorporates three aspherical elements and two high refractive index elements to suppress spherical aberrations, which help to realize a high degree of sharpness and clarity throughout the aperture range. An Ultra Multi-Coating has also been applied to control flare and ghosting for increased contrast when working in strong lighting conditions. The lens's autofocus motor works in conjunction with Sony cameras' AF systems for quick and precise focusing performance, and manual focus override is also available for more refined control. Compact wide-angle prime is designed for full-frame Sony E-mount mirrorless cameras, however can also be used with APS-C models where it provides a 36mm equivalent focal length. Three aspherical elements and two high refractive index elements help control spherical aberrations and distortions for improved sharpness, resolution, and clarity. Internal focusing design maintains the overall lens length and prevents the front of the lens from rotating during use. Included lens hood helps to block stray light from causing flare and ghosting. Box Dimensions (LxWxH) 5.0 x 4.8 x 4.7"
AF 24mm f/2.8 FE Lens for Sony E is rated 4.0 out of 5 by 3. Rated 5 out of 5 by Martin from Good lens I bought this lens for street photos and so sharpness wasnt a major consideration however it does a decent job even wide open. It is very compact and unobtrusive to use. The colors look great and the AF speed is excellent. The manual focus ring operates smoothly and is well damped. There is some vignetting and distortion that are both easily corrected in post. Overall this is a great little lens and very fun to use. Rated 2 out of 5 by Bob from not sharp While it would be great to have a light, small, full frame 24 2.8 for my sonys, the lens I received wasnt very sharp even stopped down, and was constantly back focusing. 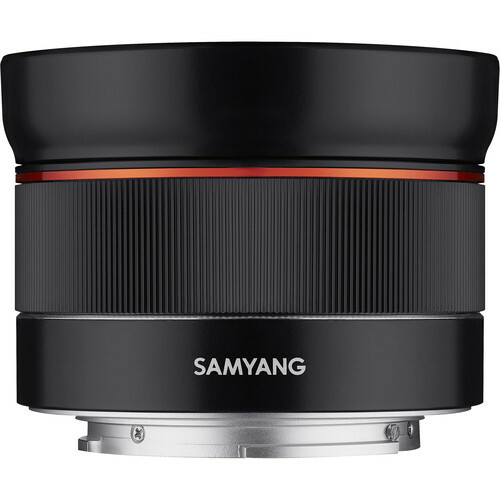 I have other Samyang lenses for my Sonys (the 20 1.8 is great), so I had high hopes for this one. But it didnt measure up. Rated 5 out of 5 by Daniel from Outstanding for the money As long as you stop down a little this lens is pretty sharp, even to the edges. Good color, contrast and AF speed too. Does this lens come with a lens hood?